The VTech VM302 is a video camera. It tansmits 25 frames per second Full-motion video to the monitor. The camera has two infrared LEDs and the low-lux camera automatically detects dim light, providing clear video even in dark rooms. It can transmit up to 1000ft range. The VTech VM302 has many exciting features for users of all types. You can extend the lifetime of your VTech VM302 with the purchase of a FactoryOutletStore Factory Protection Plan. 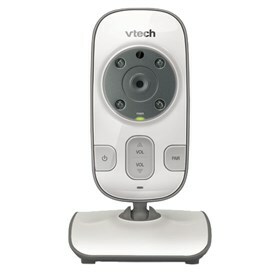 See the VTech VM302 gallery images above for more product views. The VTech VM302 is sold as a Brand New Unopened Item.